40 mm / 1 9/16 "
45 mm / 1 3/4 "
50 mm / 2 "
Metabo combination hammers and chipping hammers that are equipped with an SDS-max bit retainer, are constructed for particularly demanding application areas with highest requirements. Drilling and chiselling in concrete and stone are extremely demanding on machine and tools. A high impact energy is required for fast work progress. It is mainly determined by two things: on the one hand by the power of the motor and on the other hand by the impact mechanism of the hammer that applies the force to the tool. High-quality hammer drill bits and chisels ideally complement the performance of the Metabo hammer. Maximum drill performance or the best chiselling results can be achieved only when all components of the hammer system are adapted to one another. 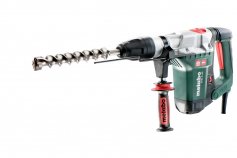 Metabo get to the heart of both: Powerful SD-max hammers and a high-quality range of accessories for hammer drilling and chiselling. When you have to hammer drill and chisel alternately, an SDS-max combination hammer is the ideal power tool. Thanks to the SDS-max bit retainer, drill bits and chisel bits with SDS-max drill shaft are quickly replaced, safely anchored and ready for the next job. Vibrations are an important topic in hammers. Thanks to the Metabo VibraTech (MVT) technology all possibilities for vibration reduction are exploited. Decoupled handle areas, integrated damping elements and other details ensure working with the lowest amount of vibrations possible. Further safety functions are the soft start and the S-automatic safety clutch that immediately decouple the drive mechanically when the drill bit jams in the material. The generated reverse torque on the user (kickback) is thus reduced extremely. 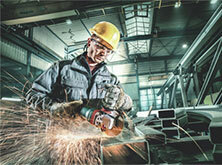 Maximum user safety is top priority for Metabo. For pure chiselling work, Metabo offers weight-optimised, powerful SDS-max chipping hammers. Up to 20 Joule of single-impact energy hit stone or concrete strike after strike. Thanks to the side handle that can be positioned flexibly and a lockable switch for continuous mode, these robust SDS-max chipping hammers can be safely guided by the user. The integrated Metabo VibraTech (MVT) damping system reduces the vibrations as much as possible to protect the user when chipping. Every power tool can only be as good as the tool used. This applies also and in particular when hammer drilling and chiselling. 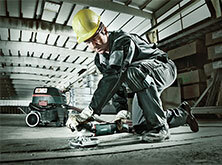 Metabo therefore recommends the use of Metabo accessories for SDS-max combination hammers and chipping hammers. 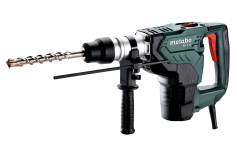 SDS-max drill bits and SDS-max chisel bits from Metabo have particularly high-quality properties and complement the Metabo hammers in an ideal manner: Quick drilling progress and highest material removal when chiselling. Different quality classes cover any range of requirement, also SDS-max dust extraction drill bits for low-dust drilling are part of the range. Concrete core cutters with SDS-max shaft in diameters from 45 mm to 80 mm are also available. A coordinated and sophisticated system for work results that meet even the highest of expectations.